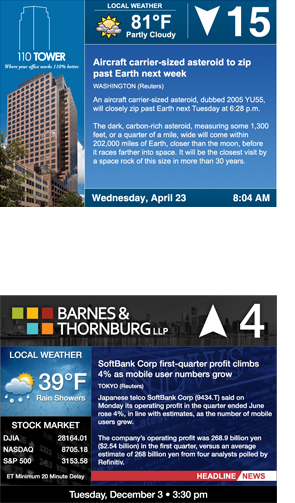 The Elite+ subscription is a text-based service that will provide your screens additional features such as Headline News, the Stock Markets (Nasdaq, Dow, S&P), and your local Weather. By combining these new features with your already existing Elite PI screens, this service will make your elevator displays the most dynamic and flexible position indicators available on the market today. Now your displays will offer more than a representation of a simple elevator position. It will now become a multi-functional unit designed to display custom graphics and text, such as advertisements, tenant, building information, text-based messages and now headline news and stock updates as well as the local weather. With the Elite+, your building will be able to display the latest news and keep your riders up-to-date with what’s going on in the world all while getting them to their destination. Stay Informed. Ride The Elevator. This service is available in a 1, 3 and 5 year price options and is paid monthly. Contact us for pricing and availability. Additional design options are available below. This may give you a better understanding of our live data features.